"Provocative, even startling, and more edifying than you might expect." 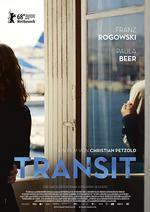 "TRANSIT touchingly illuminates the close bonds that can form within migrant communities, even as it refuses to harbor any illusions about how easily those bonds can be broken." "The result is a film that lucidly traces the specter of fascism (never extinguished, always waiting to exhale), and how unreal it feels for it to cast its shadow across Europe once more. It’s also a film that feels stuck between stations, so doggedly theoretical that it borders on becoming glib."